You will be lucky today as I’ll get two posts out on the same day. Actually, since I’ve already posted a short update on my tech blog, I think I might be setting some kind of record on productivity. In any case, I wanted to jot down some of the important things from the past week and I also wanted to do a review on Premier Protein’s shakes and snack bars. I didn’t think the two would go together, so I’ll just write up two for the day. I’ve been getting busy this week on the job search front. I have a good friend that is helping me with that process. He and I talked this past Saturday and now I have a good bit of resources on what to do next. I’ve spent the week going through a process guide he gave me and it has helped. I’m trying to get my resume done up correctly. You wouldn’t think it would be that hard, but I happen to be trying to switch careers. I’ve done a lot of IT work over the last four years, and a lot of similar type of work in the years before that. I’d really like to keep it going. I have some disadvantages in that I don’t have all the little alphabet soup certifications after my name. I just happen to know how to do the work. I’m kind of weird in that respect that actual experience and merit count for more than just tests, exams, and paper. Not that I haven’t done those either. However, today, I thought I’d spend a little time just doing things I like. I have a web site of my own that I run and it needs some work. It’s kind of the “cobblers children never have any shoes” syndrome. If you sit on a PC all day doing coding and IT work, you don’t often wish to do it when you get home. Therefore, my little site is kind of drab and needs some sprucing up. It doesn’t do much and unless you’re a serious geek it may not mean much. However, if you just want to see what happens, look at it every now and then and you’ll see it start changing as I work on it. You can find it here, it’s called the T.A.R.D.I.S. Server Project II; mostly just an information type page. Running has gone well this week. My foot’s tendonitis is still acting up a little, but I’m trying to take good care of it. It hasn’t cost me any days yet. I have almost finished my second week of marathon training and I guess this week is the week of forgetfulness and loss. Twice this week, I’ve forgotten to plug in the garmin and had to use my smartphone’s abilities instead. One of those was my tempo day, so no HR controls. And, my SmartCoach plan on Runnersworld.com got messed up again. I got it back, but it’s off a little so I am adjusting as I go. I’ll run my 12-miler on Saturday and that will finish out a good week of running. Next week will be triathlon week. Yeah! I only go round to setting up and planning for just one triathlon this year, so it’s kind of a big deal for me. It’s the same sprint tri I did last year in September. This will make my second tri and I’m hoping to see improvement over last year (which wasn’t bad at all BTW). I will once again take the Fuji out for the bike portion (do not fix what ain’t broke). I’m also making some last minute decisions on how to handle some other issues with transition. The transition area at the Rose City Tri is very sandy, so I’m concerned about my bike shoes. I wear Speedplay pedals and I know I won’t have time to put on or take off the covers in the bike out area. I also haven’t learned how to lean over and do my shoes up on the bike (I don’t balance well). The reason it’s of a concern is that the cleats on the Speedplays are big open holes that can easily clog up. We’ll have to wait and see on that point. I am also taking a hat with a bill this year for the run. Last year, I just turned my cycling hat around and wore it on the run. But, the run portion has a lot of east-west running and it’s right in the face of the sun. I’m not a fan of that on or off the bike, so a hat will be a help. It doesn’t take long to put on in transition. Finally, swimming should be better since I can do the whole distance with freestyle strokes now. I started with “where to go from here”, but I think I have a good idea where that will be, or at least I have an inkling. I will say, as I did earlier on Twitter, that it feels very odd not going to work every day. Yes, it’s only the first week. However, in thirty years or so of work, I’ve not had very long between jobs. It feels as if I’m breaking some kind of rule. As if there is some rule encoded in the Universe that says we are supposed to be at work every weekday. There is one like that isn’t there? I count myself a lucky person. I was fortunate enough to get to do two rides, back-to-back, in the same month. If you’ve been riding, running, or tri-ing for a while you probably have figured out it’s a little expensive sometimes. I am on a budget, both of time and money in regards to my “hobby”. Therefore, I usually only do one ride or race activity per month. However, because of a lucky set of circumstances, I got to ride the Tour dePepper on June 9th and the Tour d’Italia this past Saturday. This was my fifth Tour d’Italia and was my best so far. For those that haven’t caught on yet, the Tour d’Italia is in Italy…Texas. We have most of the world’s great places here in Texas: Paris, Italy, Athens, New London, and Rhome. There might be others, but I haven’t discovered them yet. Italy is a small town in Ellis County south of Dallas County, where I live. The Lone Star Cycling club puts on the Tour d’Italia each June to benefit the Italy High School athletic program. There are rides from 12 miles up to the 100K that I rode this year. I’ve ridden the 40 and 50 milers in the past. However, I like to ride the TDI (as it’s called for short) because much of it runs through Navarro County to Italy’s south. That’s where much of my Texas ancestry comes from. Riding the TDI helps me remember places where I grew up as a kid fishing with my grandfather. Though this is my fifth TDI, it is only the second 100K that I have finished. I was plagued on the first three by mechanical issues, mostly breaking spokes. The second year I had the Fuji, but only rode the 5o-miler as the Fuji and I were not completely up to making 63 miles. However, last year I finally broke the barrier and rode my Trek for the full 100K and this year, finished in good time with the new and improved Fuji (and me too, I think). The course for the TDI runs over a lot of country pasture and farm land through Navarro County, although it does get near the Navarro Mills lake area for a while. One of the best rest stops on the tour is the 30-mile stop at the park near the dam. These guys put out a great snack feast for the riders with fig newtons, plums, and nectarines. It is also the first spot on the tour where you can get a towel soaked in ice water. In June, that’s pretty helpful. What? I had looked at my Garmin just a little back and we had crossed 28 miles. Most just encouraged her to turn with us, but she also learned she had missed the 30-mile turn quite a while back. By the time she made the rest stop, she had her 30 miles done. I didn’t find out what happened, but she had a couple of choices: finish out with 50 or 60 (she had also passed the 40-mile turn), or SAG back and finish with her 30. Yep, she done had her 30 for the day. The TDI course is a lot less hilly than the Tour dePepper I rode the week previous. I was able to keep up a good pace. By 30 miles I was still at 14 mph average. I started losing it somewhere near the fourth rest stop around 45 miles. Even though we had some south wind, it wasn’t atrocious and it didn’t benefit us much as we turned north. Though the morning was cool for June, it began to heat up as we crossed over 3.5 hours. However, everything held on pretty well. I finished up my 63 miles in 4:49; breaking five hours only about the third time since I began riding. The TDI and the Tour dePepper will finish up my Spring riding. I am glad to end it on a good note. I’ve put three good 100K rides together this Spring: Head for the Hills, Tour dePepper, and the TDI. I’m going to ride round here for the next couple months while I get ready for the Hotter-n-Hell in late August. I have a good running/cycling/swimming schedule put together, and if things hold together, I should be able to do the 100-mile in under 8 hours. At least for now, the bike is doing well and I’m doing well. Enjoy your Summer. Happy cycling! This past Saturday, I ran in the first race since Bold in the Cold 15K in January. I have been rebuilding my running since shortly after that race because of a swimming injury. The Beat the Heat 5K was my first race since the injury and I think I can count the injury “under control” at least. In addition, I had a good time at a small, quite new race in my town of Irving. This was the second year for the Beat the Heat 5K and fun run. They added a 10K and hired a local race director to oversee the racing. Both were good choices to keep the race improving and getting runners to come out. The normal time for the race is in late April and that’s where I think it gets its name. North Texas heat sets in early in our neighborhood. The race benefits Family Promise of Irving, a chapter of Family Promise that seeks to overcome homelessness among families in our area. The organization partners with local churches to provide temporary shelter and day services to assist families that are recently homeless to get back on their feet. 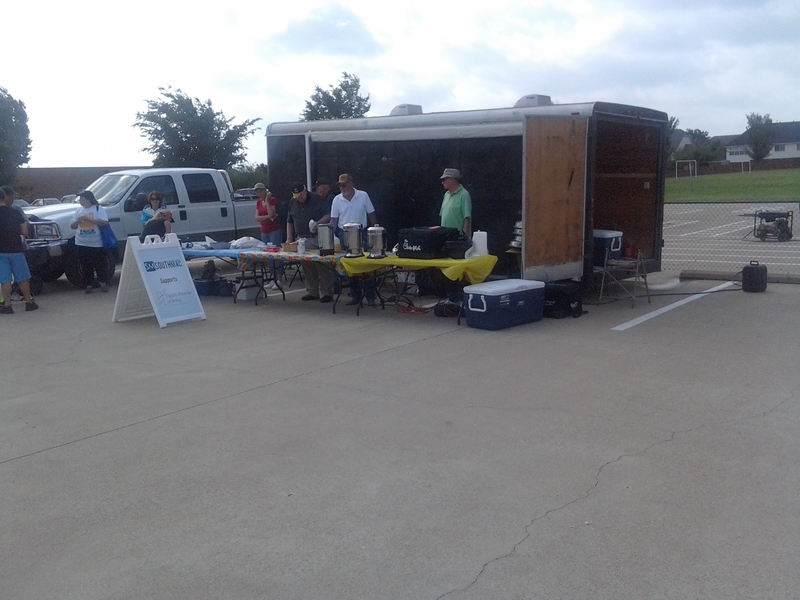 My church is one of the partners as well as many others in Irving. This race is one way that Family Promise of Irving raises funds for their mission. I chose to run the 5K at this race because I wasn’t sure where I would be in mileage at this time. However, my longer runs are up to 6 miles and I have begun to build some speed also. Since this would be a 5K, I was hoping to see how well I could run. My goal was to see if I could break the 30-minute barrier. The morning was cool, but not too much; yet, the wind was fairly strong. The race was held near Las Colinas Elementary in north Irving. There are some pretty good hills around the school area that would give us a challenge. The race organizers invite the churches involved with Family Promise to set up booths at the race and my church was well represented. We have a good group of older guys that do a lot of cooking for different things and they came out to help serve goodies for the runners. We had a good selection of goodies for the race. Chik Fil A had donated chicken biscuit sandwiches and Einstein bagels provided…well…bagels. There were also fruits and pastries as well as a good supply of coffee. The guys were trying their best to peddle the chicken sandwiches and other goodies before the race, but with little luck. They weren’t aware that a lot of runners won’t eat much before a run or race, especially shorter ones. I had a banana just to make sure I had something in my stomach, but I was waiting until after the race for the better stuff. There was a little disorganization evident with the race start and the sound didn’t work out. However, they got the kiddos off on their fun run on time and got set up for the 5K/10K. We would start at 8:30AM after the kiddos were finished. The little guy that came in first ran his mile in 6:05. Someone should keep an eye on him. We started just a little after 8:30, I think, but close. The gate narrowed us down a little, but the field wasn’t huge so we all got out quick. I took off too fast, but tried to hold it as far as I could. I had to back off at about 3/4 of a mile. I could still hold a good pace, but it was slower. We went down a long hill on Kinwest Parkway right off the bat. This looked like it would be our “demon” coming back up for the finish. We turned a corner onto a side street at about a mile out. By then we were at our second water stop. I didn’t stop at this one and at the first, I barely slowed down. I got a little bit in me and some on me. I still haven’t’ figured out how to drink and run; just not that coordinated. Our turnaround came up fairly quick and not too long after I saw the leader going back. There were several friends from my church that were running. One of our preachers was about a half minute in front of me at this point, so we saw each other on the turn around. There was a lot of uphill going back, but I kept my pace pretty well. On a side note, this was my first race to use my Android phone instead of my Garmin. It worked well, but with it in my back pocket, I don’t really know what my pace is. In the future, I should probably stick with my Garmin for races since it lets me see the pace and control it better. I didn’t see a sign for the second mile. Yet, I knew where I was since “the hill” was here. I kept my pace as well as possible up the hill, but had to slow down near the top. It was…large. However, I made it over and that left only a short run up to the finish. I saw a shadow of a couple that kept pace with me near the end coming up from behind. That was all I needed to put in the kick to get to the finish. I could see that the gun clock was just barely over 31 minutes. Not the goal, but still a PR. Now for that chicken sandwich. I waited around and talked with other folks and watched to see one friend come in from the 1oK. When I left, I stopped by the table to see the postings for the 5K. My final time was 31:14, but I was sure the counter was wrong since it listed that I was the 19th runner in. I chalked that up to technology and just went home. When I checked the web site posting later, I was amazed. I finished first in my age group (50 -59) and was 19th across the line of 97. So, not just a PR, but a win as well. That was still hard to believe. My preacher had also finished first in his age group. And, for the naysayers, we weren’t the only ones in the division either. This is a great little race with lots of good volunteers, a challenging course, and for a great cause. They are still going through birth pains and learning how to do things, but for just their second year, they are doing great. I had a good time and got to run with friends, which I don’t often get to do. The goodies to eat were exceptional and our swag bags weren’t bad either. It’s a race I will certainly sign up for next year; maybe the 10K next time. Happy running! And, a good time was had by all. That’s just the best way I can say it. This is my third year to ride the Moritz Chevrolet Ride for Heroes in Aledo, TX. Even though I chose not to do the whole 63 miler, it was a great ride. One couldn’t have asked for better weather on this April Saturday. It was 49 degreesF when I got up and the high was forecast for only 74. In addition, the winds would be light. I did better this year by going ahead and planning for the cool weather. We had a similar cool morning last year, but the day was warmer, I believe. I had not been able to do very many longer rides in preparation, so I was a little apprehensive about doing the 100K route. However, I saw that I could bail onto the 44-mile route if I needed to do so. Somewhere around 20 miles or so, I realized that I should since tomorrow, I have a five hour safety class on the bike. To make the class, I am going to have to ride to church, leave a little early, ride to the class, and then spend most of the day on and around the bike. It was better to have a fun ride today and not risk a bad day tomorrow. And, that was a good plan. The riders spread out fairly soon enough that by 10 miles or so, riding was pretty good. The courses for the Ride for Heroes ride is very hilly. My choice to take my Trek with the compact chainrings was a good idea. I’m not sure me and the Fuji are ready for almost straight up hills. Fortunately, there aren’t too many of those. Just enough to keep one humble. This is the 10th annual Ride for Heroes and it raises money for several of Parker County’s Fire departments and the Parker County Sherriff’s Reserves. The ride starts and ends at Aledo High School and the students are many of the volunteers. It is very nice to have them encouraging riders coming and going from the rest stops. Additionally, this is also one of the better supported rides I attend. The Parker County city and county law enforcement folks do a great job of guarding the intersections and corners where the cyclists turn. Knowing we will have a safe path to ride makes any ride better. The roads around the routes vary quite a bit. Some of them are in wonderful shape, while some are not as good. You do have to be on your toes to avoid bumps and ruts. I do think a lot of this comes from the gas drilling equipment that plies the county’s roads. However, the routes are scenic and well laid out. Having frequent course changes during a long ride is a preference of mine. Since the Ride for Heroes routes are well marked, I enjoy getting to change direction quite often. Some rides will have very long straight stretches of road that make you wonder when the road ends. Getting to change direction fairly often keeps the monotony down and the morale up. If there was a down side to today at all, it was that my Android died right at the end of the ride, with all my GPS tracked route on it. I did have my Garmin on and working, but I also forgot to switch it to cycling. I had to do math in my head while riding to know what my mph’s were. In running mode, the Garmin only gives minutes/mile. The dead phone also meant I had to ride around the parking lot until I spotted my wife’s car. Fortunately, she hadn’t moved far. The final time tally didn’t show it (3:31:10), but I believe I rode much better than I had been riding. I definitely know I handled the hills better than in the past. I probably just spent too long at a couple of rest stops. No flare ups from the left foot was a good bonus, and a good reason to stop at 44 miles. Now that I’ve gotten the season’s first ride done, I can look forward to more rides where I can handle the bigger challenges. Hotter-n-Hell Hundred is on my list again. Happy cycling!